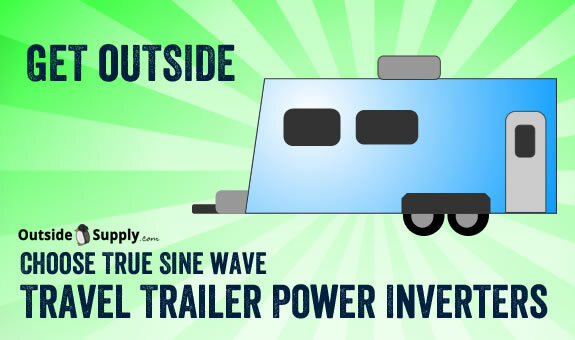 This is a simple article on how to calculate what size power inverter you need for your travel trailer. These campers are great for weekend camping and many people use a variety of electronics while on their trips. 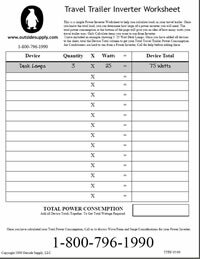 Many of these items can run on a Power Inverter or through a trailer wired inverter. Microwaves, TVs, DVD Players, VCRs, Video Games, Food Processors, and more. Once you get the Total Load Required for your power inverter feel free to call us at 1-866-574-4983 to discuss hard wiring, wave form, and surge ratings for your inverter. You can also check out our selection of Travel Trailer Power Inverters. Remember, purchasing a power inverter for your travel trailer is a big decision. Go with OutsideSupply.com to know you will get the right high quality inverter.